Micro-Epsilon has launched a new compact, robust (IP67) short wavelength infrared thermal imaging camera, which is specifically designed to measure the surface temperature of hot metals, as well as ceramics and graphite. Due to its short-wave spectral range of 1µm, the new thermoIMAGER TIM M1 is suitable for temperature measurement applications in metal processing, including the temperature monitoring of metal hardening and forming processes. In the range 0.92µm to 1.1µm, metals are subject to a significantly higher emissivity than in other wavelength ranges. 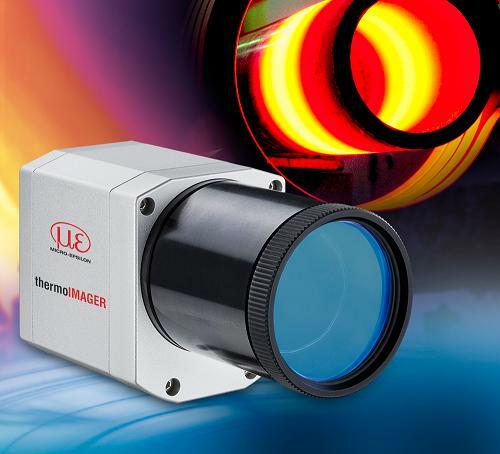 The thermoIMAGER TIM M1 has a high resolution CMOS detector with 764 x 480 pixels, a temperature measuring range of 450°C to 1800°C, and like all Micro-Epsilon thermal imagers, the TIM M1 comes with full license-free software for fast set up and easy configuration. It is very compact at just 46 x 56 x 90mm, yet for harsh environments, can be supplied with a large stainless steel air or water-cooled housing that can operate in 315°C ambient temperatures.